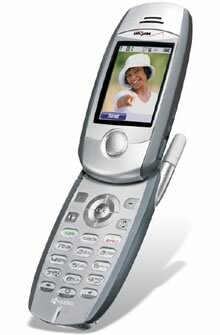 Verizon Wireless today began shipping the Kyocera KX2, Kyocera's first camera phone. Features of the KX2 include: * 1.2 megapixel camera with LED flash and video capture (up to 15 sec) * 132 x 176 pixel 262K color display * Speakerphone * BREW * Swivel style design Pricing for the Kyocera KX2 runs as low as $149.99 with a 2-year contract. Click on thumbnail at right to zoom.